Fatal flaw: Sunday duffer spin. Awful results Pull, slice, hook, smother, or shank. Magic move: Lateral hip slide, with head back. Check points: One knuckle of left hand visible, two of right hand; right arm touching side. We have now reached the most important and critical area of the golf swing: The golf downswing. With it we uncover the most common and at the same time most devastating flaws in golf. The golf swing itself is probably the most difficult and certainly the most elusive action in all athletics. The peak of frustration is reached here because, no matter what has gone before it, this one move can make a greater difference in the result of the swing and the shot than any other. We can have a perfect grip, start back from the ball properly, reach the top in faultless position — and then ruin it all by the next move we make. 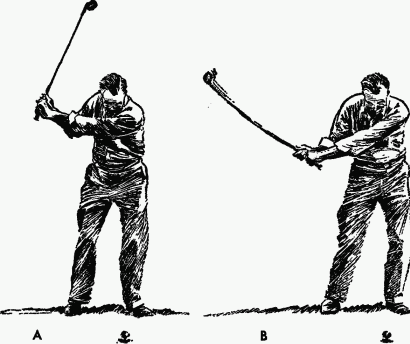 Not only can the swing be ruined by this move, it is ruined about 95 per cent of the time. trying to move the club head or slowing down the hands. These moves bring quick disaster by causing two things. They make us hit too soon and they make us hit from the outside in. The first robs us of distance, the second of direction — and what else do we want from a full shot? Because we hit too soon, the drive that might have gone 220 yards goes only 190, and into that trap that juts out into the fairway. 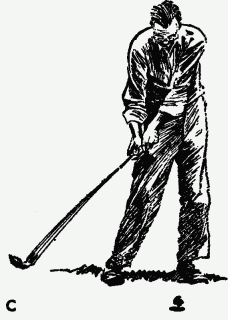 Because we hit from the outside instead of from the inside, the ball is pulled, and, if the face of the club is not square, it will be hooked or sliced, or perhaps smothered or even shanked. "We can have a perfect grip, start back from the ball properly, reach the top in faultless position - and then ruin it all [with a bad downswing]"
The best we can hope for is that we will slice it only a little and that, after starting to the left, it will curve back into the fairway. Even if we are that lucky, we will know we have hit a weak and sloppy shot. These are the actions and these are the shots that we see on every private course in the country, every public course, and in stall after stall of every driving range. It can truthfully be said that this is the natural way to hit a golf ball— with the Sunday duffer spin. It is also the principal reason that the scores of our millions of players remain so high. These actions in this one area of the swing produce bad shots in such astronomical volume that the short game, no matter how good it is, can't take up more than a little of the slack. We will say without fear of contradiction that a player who makes these moves and still gets around in 86 on a good day would cut ten strokes from his score if he made the right moves. So, what are the golf downswing magic moves? There are 3 moves: (1) Move the hips laterally to the left while (2) keeping the head back and (3) making no effort whatever To move the golf club. Each of these moves are discussed separetely in each of the links below.